To drink great wine, you sometimes need to go to...the hospital. Founded in 1395, the Cave historique des Hospices de Strasbourg (Historical Hospital Cellar) allowed the storage of wine and also other alimentary staples. Patients paid for their hospital care with a plot of vines or a piece of land, or even bequeathed their worldly goods to the hospital for the good of their soul. 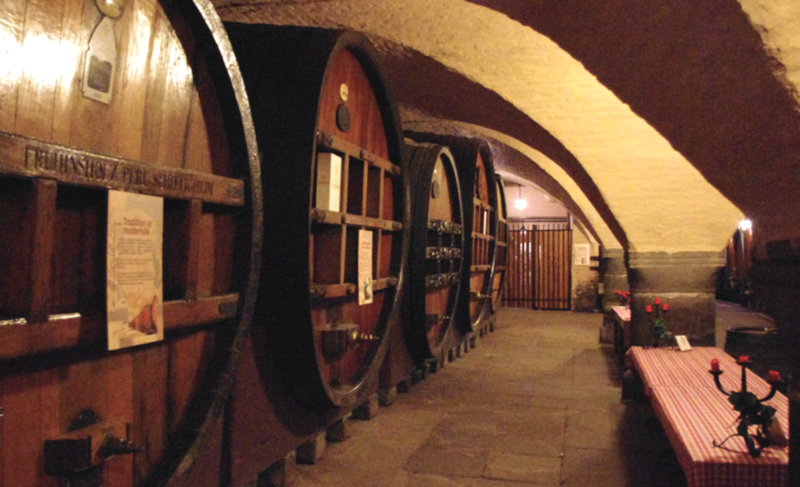 Over six centuries, the wine from grapes grown on the Hospital's lands was produced in this cellar. One of these huge wooden edifices is engraved with the legendary date of 1472. The interior contains the oldest barrel-stored wine in the world, 450 litres of a legendary vintage. Today, the Cellar continues to play an important role in regional winemaking history. Since 1996, 25 vineyards distributed from the north to the south of the Alsatian winegrowing area have come to improve their wines there under the supervision of an oenologist. You can buy them at the Cave historique shop, where you are sure to find the latest vintages. Open from Monday to Friday from 8.30 a.m. to noon, then from 1.30 p.m. to 5.30 p.m.
Open Saturday from 9 a.m. to 12.30 p.m.